New regulations that will increase the amount of renewable fuel blended into the transport fuel mix could see the UK introduction of E10 petrol at some point – bringing environmental gains but also possibly fuel price increases. Effective from this Sunday (15 April), the change to the Renewable Transport Fuel Obligation (RTFO) will increase the proportion of biofuel in each litre of road transport fuel from 4.75% to 7.25% this year and 8.5% next year as part of ongoing mandatory increases in biofuel proportions, reaching 12.4% by 2032. According to the Renewable Energy Association, which represents renewable fuel manufacturers, the higher obligation levels should at some point encourage fuel suppliers to make E10 petrol available. The 10% bioethanol blend which can be used by modern cars is found in USA, Canada, Australasia as well as in much of Europe, although the UK continues to offer E5 (5% bioethanol blend) standard unleaded petrol. In its response to the consultation on the amendments last year, the DfT had said increasing the renewable content of petrol by moving to E10 fuel should make “achieving our targets easier and potentially more cost effective, as well as providing an economic boost to domestic producers” and added that the government would work with industry to facilitate any future introduction of E10 petrol. However, RAC Business has previously warned that the introduction could bring issues for fleets. 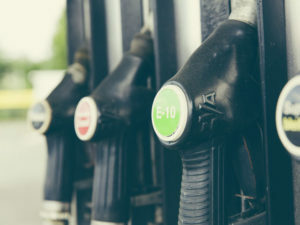 Although compatibility issues with older vehicles are not expected to affect fleets, the increased usage of bioethanol in E10 and its impact on fuel efficiency, particularly for cars with smaller engines, could present problems. According to a report issued by the Low Carbon Vehicle Partnership (LowCVP), biothanol has a lower energy density than petrol and, consequently, the volumetric fuel consumption using E10 petrol is expected to be slightly (1.5%) more than E5 petrol. In response, the LowCVP has said that fuel duty should be adapted to reflect the different energy content of E10, providing a price differential to E5 to encourage usage. Fleetcor, which provides fuel cards and workforce payment products and services, also warned that the latest 2.5% increase in biofuel proportions has highlighted concerns of price increases although it stressed the environmental benefits of the change to the UK Renewable Transport Fuel Obligations Order. Paul Holland, chief operating officer at Fleetcor, said: “In response to these concerns, whilst cost increases are never welcome, the impact of this change affects all and is clearly an important step in addressing critical environmental challenges.